Of course I am not pretending to surpass food bloggers like ladyironchef here, but I thought I’d share with you my top 5 brunch places so far! P.S. 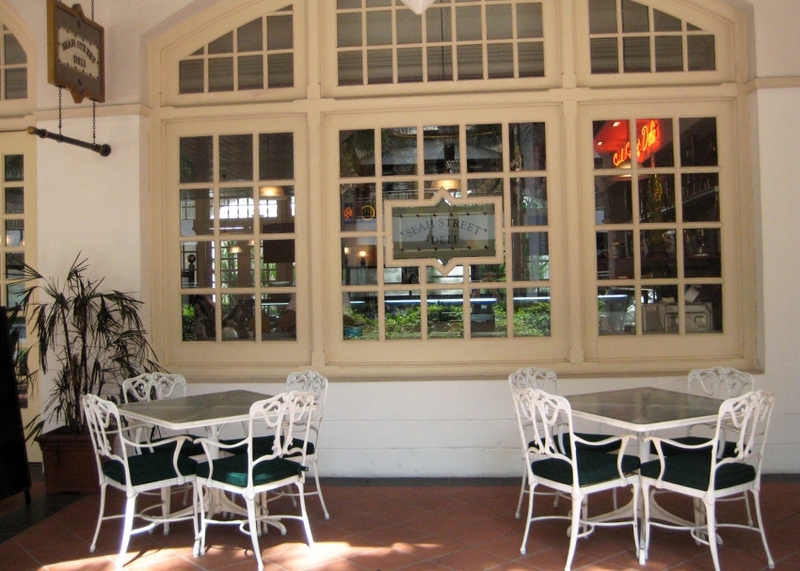 Cafe is well known in Singapore for great quality and healthy food in wonderful settings. 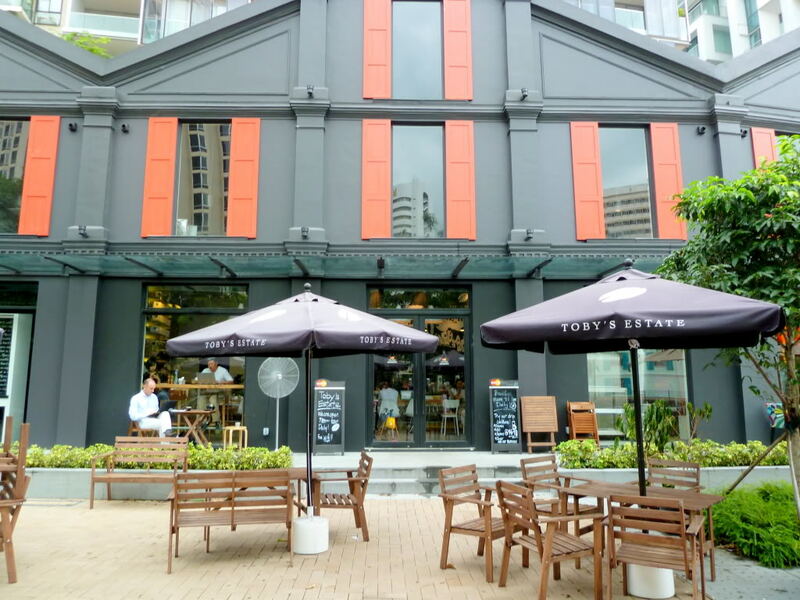 I love the one at Ann Siang Hill (just uphill from Club Street), because it is surrounded by a little greenery and the counter area is both simple and sophisticated. All in all, it’s a wonderful place to relax! And their meals are always healthy, with a fresh spinach salad or avocado on the side to green up your brunch! To note that it may be a little pricy for the average budget you might have for brunches. The perfect start to your day if you have a craving for pancake and a little tight budget! Strictly Pancakes is affordable and yummy, and the service team is young and smiling. You may think pancakes are overrated… in which case you can get creative and add on scrambled eggs and bacons! Yes, it may seem like a strange sweet-savoury combination at first but you grow into it 🙂 And they have a good sense of humour too ! 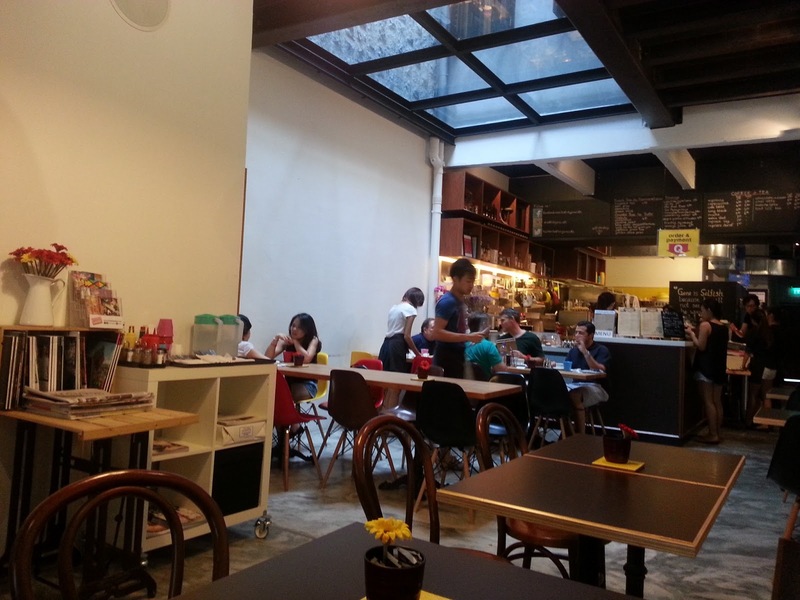 There are 2 outlets currently in Singapore, one in Siglap and one on Prinsep Street. 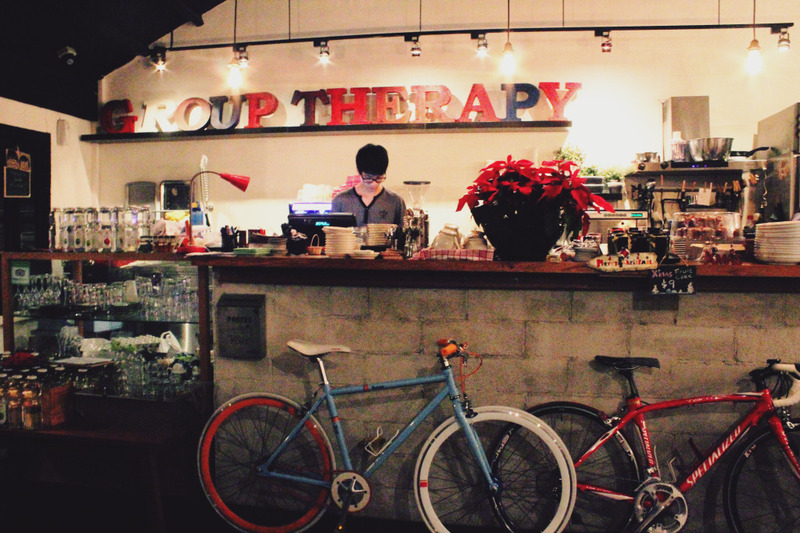 To be honest, at first I was a little put off by the name of this place “Group Therapy“. I found it odd to have a brunch in a “therapy” place! But once you step in, you will love the decor and ambiance here, and their menu is quite long so you’ll be sure to find you perfect brunch. One minus point though, this coffee place is so successful that more often than not there is a queue on week-ends and the staff does not take reservations. But try your luck! If it’s not too many of you, you should be able to get a table within 15 minutes! Excellent coffee at Toby’s Estate! And I like the fact that they are located by the Singapore River, near Robertson Quay area. If it’s not rainy, choose to sit outside and enjoy a nice cup of coffee while watching passers by. Food-wise I remember the brunch as decent, however not top-of-the-chart so far. 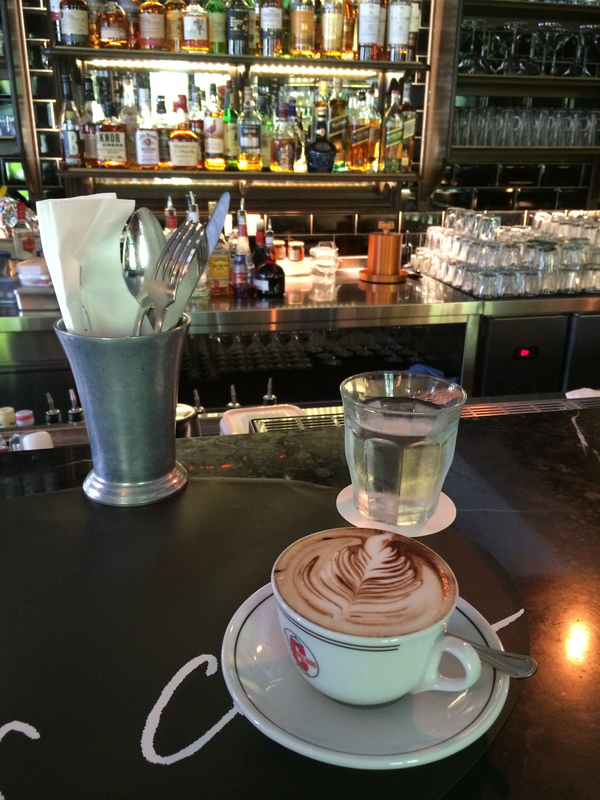 Last by not least on my top 5 is Selfish Gene Cafe on Craig Road. Inside you will find a stretch of tables leading to the counter where you can order your meal. I love the glass ceiling that lets the daylight come through! I enjoy the food there, however there is often a long waiting time (average 20-30 minutes from my experience!) and some of the menu items are overpriced. My recommendation would be to stick to one plate each and don’t order sides or add-ons, they’re a bit too expensive for my taste. I hope you liked my top 5 so far! Brunch places in Singapore are ever-changing so please comment and leave us your thoughts on the trendiest brunch spots now !! A few weeks back, I was looking for a place to grab a beer with some friends visiting in Singapore. 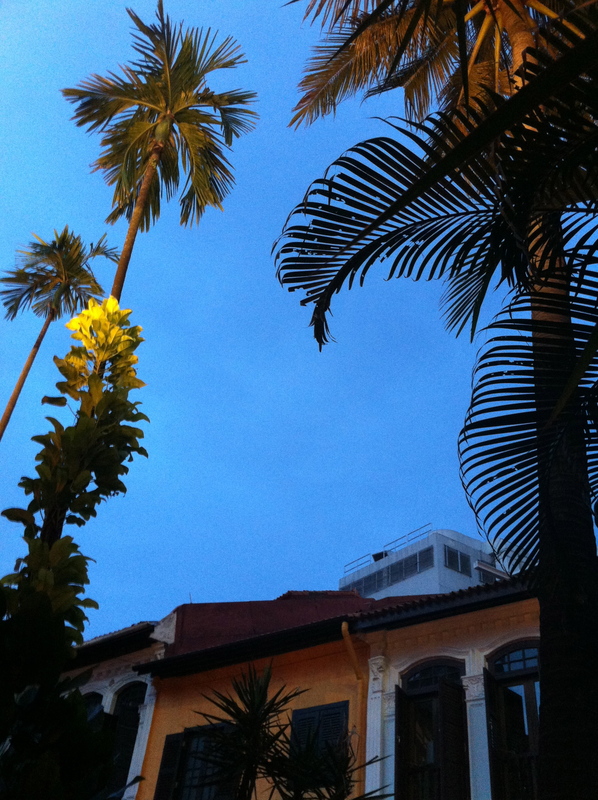 Someplace casual, easy to access, and not (too) expensive… so I scratched my head… and thought of Emerald Hill !! I don’t know whether you are familiar with this area, but to me the first time I went there was really a good surprise and it has been one of my favourite spots in Singapore ever since. 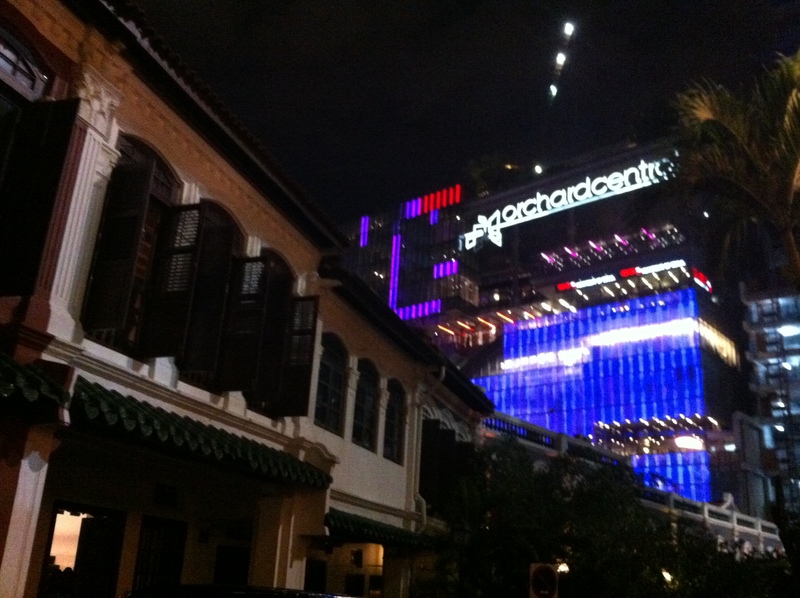 The first great thing about Emerald Hill is that it’s super conveniently located just off Orchard Road. It’s a few steps away from Somerset MRT and the mall 313@Somerset. The second great thing is that as soon as you turn into this uphill street you forget that you’re on Orchard Road! 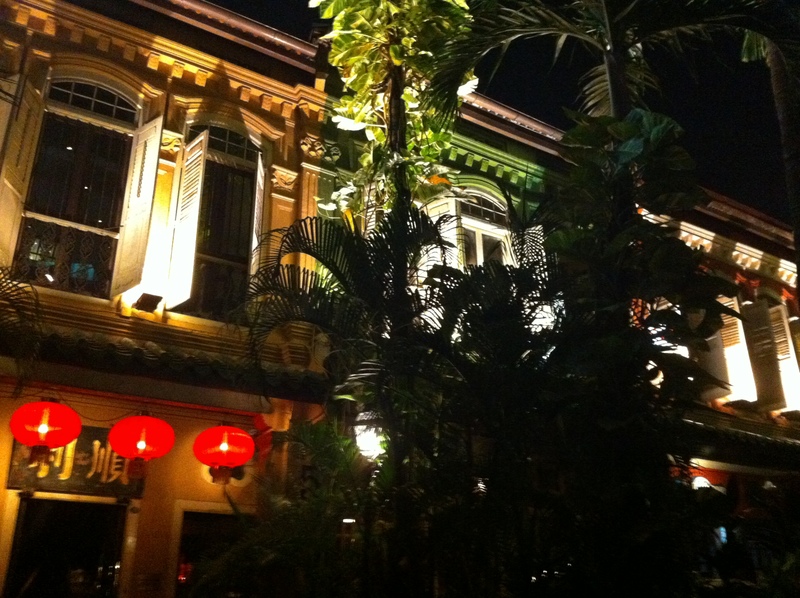 The place is peaceful, green, quiet… and it’s only shophouses and traditional Chinese mansions. It’s truly amazing, in all honesty!! I would strongly recommend Emerald Hill for a relaxing night out. However if you prefer sitting outside, it’s usually quite crowded so you should go there early! When I feel like having something different for dinner, one of my favourite places is Piedra Negra, a Mexican restaurant and bar on Haji Lane. “Piedra Negra” (which means “black stone”) actually has nothing to do with Black… it’s extremely colourful!! 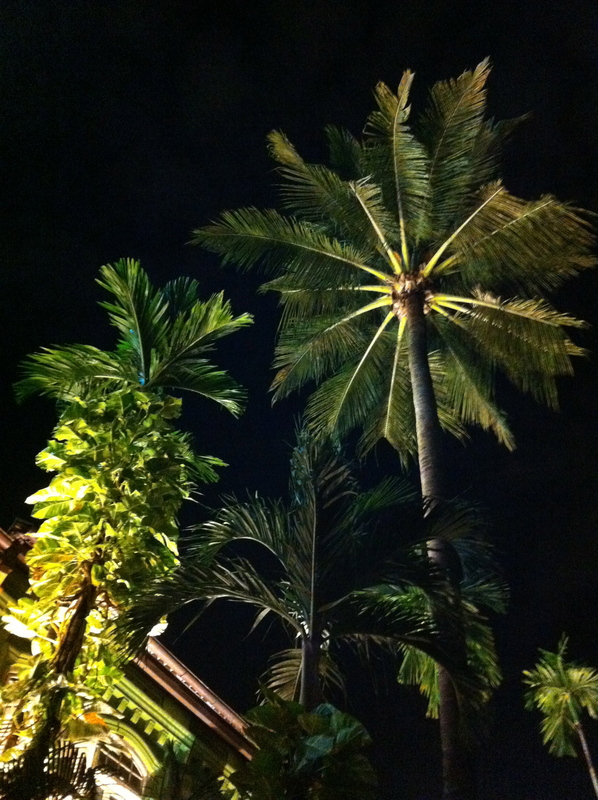 And I love it because the atmosphere is lively and very latino-like! Some of the deco reminds me of Barcelona, some of South America… Actually the menu is not all Mexican, as you can have Spanish tortillas or South American empanadas! Hmmm yummy all my favourites! A luxury to have these in Singapore maybe? Piedra Negra is also a great chill out place, and I recommend you try the nachos, served with guacamole, frijoles, jalapeno chili (careful there, it’s really spicy!! ), and covered in melted cheese – see picture. Also a good combination, have it with a glass of cool sangria, or frozen margarita (even though in the Singapore heat it will not stay frozen for long). Hey guys! Have you heard of ZoukOut? Surely you’ve heard of Zouk, one of the most famous night clubs in Singapore. Zouk usually features very good electro-dance DJs, and also had (until July this year) a very popular theme night on Wednesdays, the Mambo Jambo night, where they played retro music from the 80s. Well, Zouk decided in 2000 to bring the party… to the beach!! 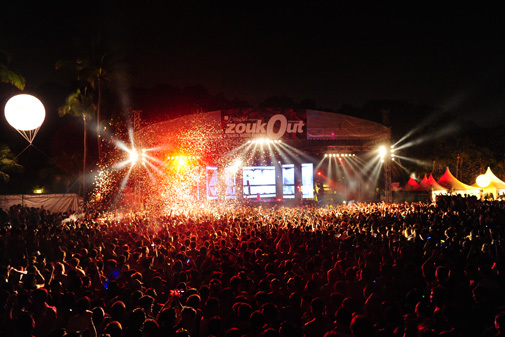 Branded “ZoukOut”, this annual event is a dance music festival where world renowned DJs fly in to Singapore. A must-do for newcomers! This year I went there for the first time. The ticket price was (I felt) very high… 98 S$ per person for just one night (there are 2 nights, usually Friday and Saturday). You do have an early bird ticket at 78 S$ but you really have to be quick to get one, as tickets sell REALLY fast!! I reached Siloso beach (on Sentosa) around midnight with some friends and there was already quite a crowd. The festival showcases artists from 8pm to 8am… so you can imagine the size of the event 😀 ! I found the beach quite nicely set up, with sponsors booths lit up, and 3 large well-positioned scenes (not too close from one another). It’s also well thought that there are many bars, all around the area, and they are numbered so it’s easier to find meeting points with your friends. There are also a few “fun” booths, were you can participate to games or have your fortune told by a guru… Quite entertaining I must say! And of course some food and beverages outlets, with a quite diverse range of options, however quite expensive as expected. If you’re lucky, you might also catch the 5mn fireworks – as we did!! After a while though, I felt the music was not of my taste, and the crowd really started to bother me (with time crowds get drunker… 😉 ) so I headed home. But I think if you’re really into electro/disco/trance music you will definitely enjoy this event. This year’s edition featured Calvin Harris and Paul Kalbrenner for instance! My recommendation is to go if you like beach parties and excitement 🙂 but think about it twice if you’re weary of the price, or do not like crowds too much! Also, if you go, please wear comfortable footwear, and remember not too bring any food or drinks with you, as it will be taken at the entrance (but you can buy food and drinks inside). Who says Singapore is boring and always the same? 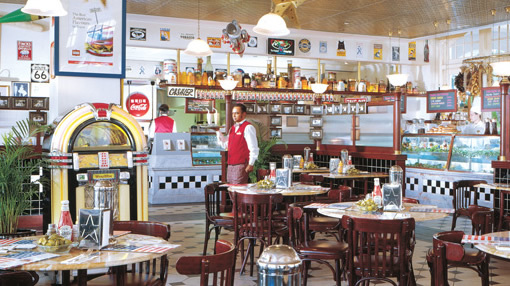 If you look hard enough, you might find a couple of surprising places… like this American Diner on Beach Road, incorporated into the Raffles Hotel building ! I must admit the food is sometimes a little oily or fat… However one of the reasons why I love this place is because of the atmosphere! The decoration, floor and furniture really make you feel like you are in a whole other place. There’s even a jukebox in a corner!! And even though I’m not American, I love to be able to “travel” while still being physically located in Singapore. Well, actually, located in the HEART of Singapore!! Remember Haji Lane? 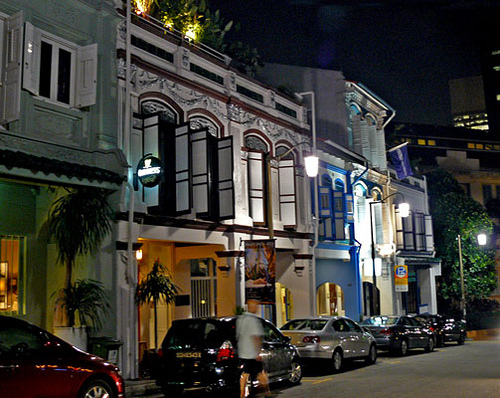 Small, discrete and yet trendy street hidden in Kampong Glam near Arab Street? I discovered a new place that people had told me about, Bar stories. You have to look for it, it’s not very well indicated, and on the second floor too. 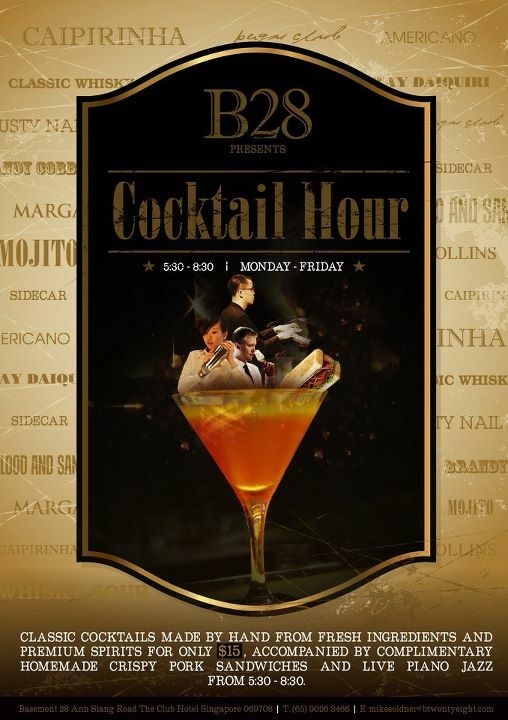 The originality of this place is that you can customise your own cocktails/mocktails. 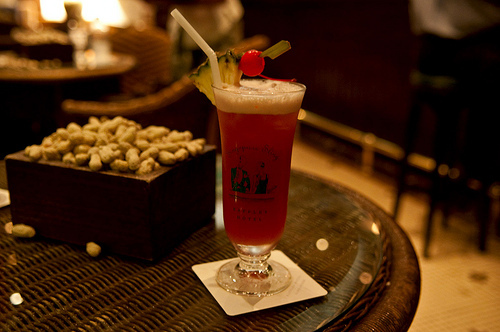 And if you have no idea what combination would be best, the bartender will help you out if you tell him your usual preference (sweet/sour/fruity/else…). I really enjoyed my drink, and so did my friend with hers. 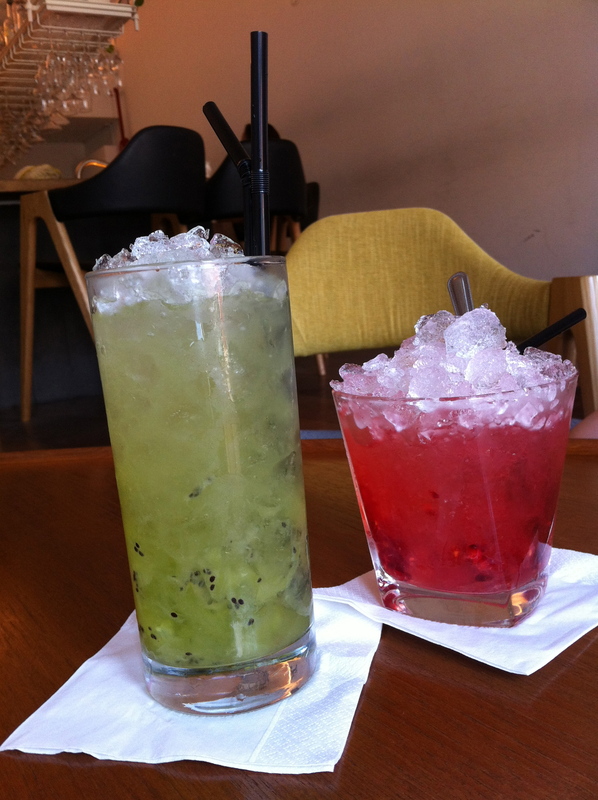 I asked for something not too sweet and refreshing and I was given a cool lime-based mocktail with little bits of kiwi, while my friend had a sweeter and fruitier drink with strawberrys. Yummy. The setting is also quite relaxing, with nice cafe-style touches. And prices are ok (although they must be higher at night for cocktails). So go for it 🙂 I recommend it ! !